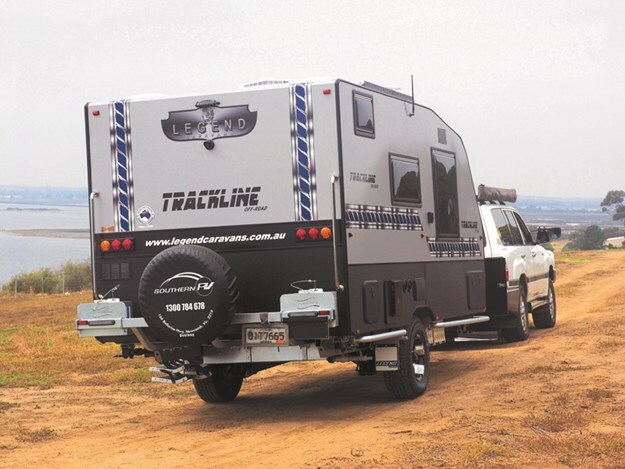 Measuring in with just 4.6m (15ft) external length, the Trackline from Legend Caravans might be among the smallest vans in the market, but, through smart design, it still manages to fit in all the necessities of a modern RV. The company says that while the main market is for vans over 5.8m (19ft), there are still customers wanting the ease and simplicity of something smaller. Many Boomers might be amused to consider how it compares to a similar size van of the 1960s, in which they spent their youthful summer holidays. The comparison is relevant because the level of livability in the Trackline is remarkable, considering its size. Where did all that extra space come from to be able to include an ensuite, a useful kitchen and a roomy double bed? As well as the versatility of interior design, the little van takes advantage of its light weight and diminutive footprint with a serious suspension package and a heavy-hitting chassis. These enable it to be towed into some of the more inaccessible locations. Although nominated by Legend as a semi-offroader, the package should be capable of accessing places that a larger, less well-supported van would struggle to reach. It's not designed for serious four-wheel drive adventures, but the benefits of its smaller size and mass can't be overstated. Riding high on 4in risers over a 6in G&S Supergal chassis and A-frame, and supported by a 2.5t Control Rider TS suspension (see breakout), the pint-sized van looks the part and has ample clearance underneath to negotiate rutted tracks and washouts. Although its modest length adds to the impression of height, the centre of gravity is low and I found no evidence of it moving around unduly when underway. In tune with the modern, more hard-nosed style in vans with offroad capability, the Trackline range has black X-plate running along the bottom edge of the exterior and stylised tyre tracks along the sides and as racing stripes over the top. 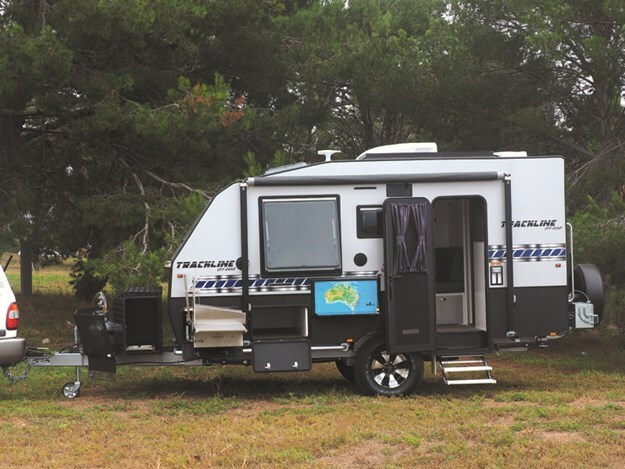 Smooth grey composite aluminium cladding and a set of rock sliders add to the rugged impression, and rear-mounted jerry can holders, and a large black checkerplate toolbox up front continue the bush touring theme and add useful storage options. 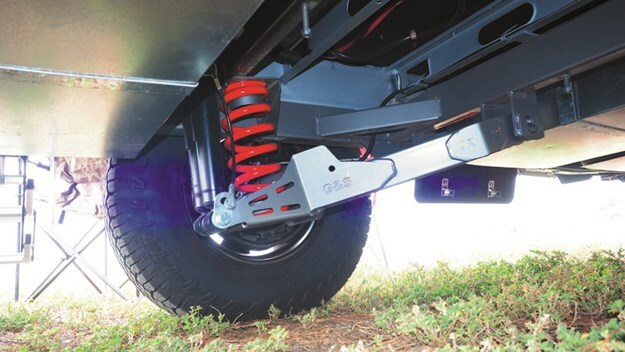 At the drawbar are a Vehicle Components DO35 hitch for superior articulation over steep ground and a heavy-duty jockey wheel with a secure twin clamping mechanism. 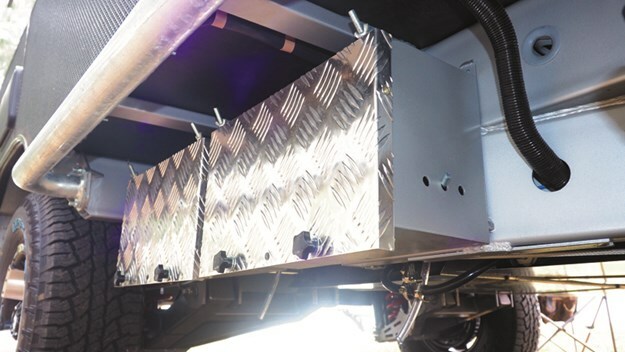 Low mudflaps on the full-width stone guard add protection underneath, while slide-out trays on both sides of that big storage box would give easy access to a generator and larger storage items, although I would caution overloading, lest the van's balance be compromised. A separate section at the top of the toolbox is a handy place for mats and ropes, while an overhead LED will light up the area at night. 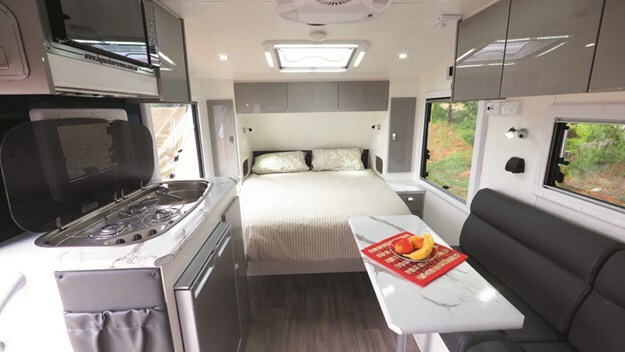 Perhaps recognising that a small van has limited cooking space, Legend has installed a well-designed and comprehensive slide-out kitchen in the forward section of the outdoor living space. 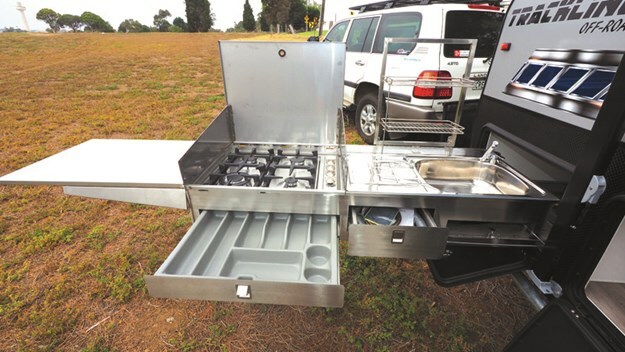 Neatly constructed from stainless steel, it has a fold-out extension for extra bench space, a sink, cutlery drawers and gas burners. A nifty crockery rack lifts up for more storage and a large hatch is handy for keeping extra cooking items. Further back is a picnic table with an Australian map just begging to mark your travels around the country. A 10ft awning covers the outside space, and an outdoor shower will be handy for washing off the sand before going inside. The rear security door includes an insect screen, and I appreciated the fold-out step and grab handle with light to help access the high-riding van. Once inside, the surprises just keep on coming. Most compact vans with an ensuite will compromise by positioning the bed in an east-west layout across the van. While this maximises the available space, it creates two problems. Firstly, access from the inside sleeping position without disturbing your partner is almost impossible, and secondly, the bed is very difficult to make. Trackline solves this by installing a much more-livable north-south queen island bed and still offering a full-width ensuite and a useful kitchen/dining area. OK, the bathroom is narrower than those in a lot of larger vans and the kitchen bench space isn't huge. But it's a clever design that packs in features to make it an excellent prospect for long distance exploring or just weekends away. As well as a stainless steel three-burner gas stove and sink combination, there's a microwave and a 100L Dometic compressor fridge. A large drawer under the lounge complements storage cupboards above the sink and over the dinette, but space is limited, so be careful what you pack. Hoarders be warned. 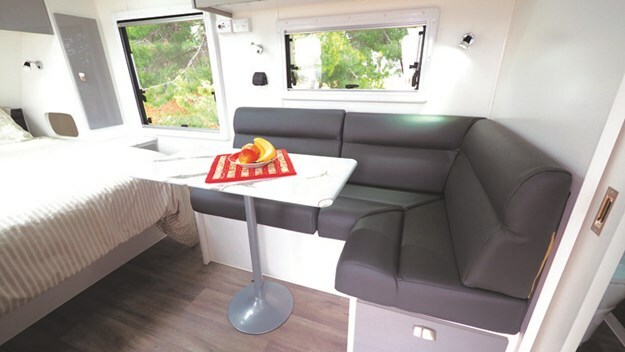 An L-shaped dinette includes a swivelling table and neat vinyl upholstery on the high-density foam two-seater lounge. The entertainment pack consists of a Bluetooth sound system hooked to internal and external speakers and a wall-mounted 24in television with a King Jack antenna. As mentioned, the ensuite running across the rear of the van isn't the largest, with the main compromise being around the Thetford toilet, but there's a separate full-sized shower, vanity with large mirror and storage in shelves and cupboards. Roof hatches and fans provide proper ventilation while lighting is bright throughout. Tare weight is 1895kg, and ATM is 2500kg, giving a load capacity a tad over 600kg. With the twin 95L water tanks and twin 9kg gas bottles filled, that still provides a healthy 400kg or so for personal items, camping gear and supplies. Off-grid potential is strengthened by 300W of solar panels charging two 120Ah chassis-mounted batteries through a 40A Voltech charger. The wiring looks neat, and monitors will keep you up to speed with the power supply. Most of the current range of 4WD utes and medium-range wagons are capable of towing the Trackline's 2500kg ATM potential, so our 100 Series LandCruiser managed easily. Both on the highway and over the rough stuff, the Control Rider suspension soaked up the bumps and delivered a smooth ride. 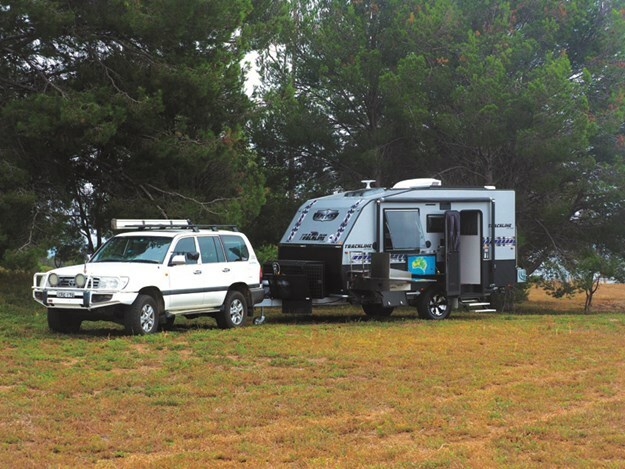 The caravan's compact size makes it easy to park, easy to reverse into confined camping spots and short enough to traverse narrow tree-lined tracks. This baby Trackline swims against the trend to larger and more complicated vans without missing out on too many of the comforts we now find so necessary. Not only those stepping up from a camper to the easy setup of a van will be drawn to the simplicity and economy of this compact van, and at $59,990 it has a lot to offer.